Search For "Media" Companies in Orlando, Florida - Click Here Now! 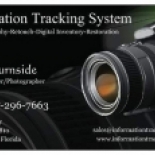 Nformation Tracking System Offers Digital Photography, Retouching, Restorations, Digital Inventory, Photojournalism. Creating A Digital Inventory Of Your Items Covered By Insurance. This Provides You With Proof Of Ownership When Its Time To Make A Claim. No Hassels, No Issues With Insurance Companies On Proving Or Providing Inventory Or Condition Of Property Damaged Or Lost. We Provide Copy To You And Also Have Service To Keep Records On Our Servers, They Are Backed Up With Off-site Data Base Just Incase Of Disaster. I.T.S. Photography Offers Retouch To Digital And Physical Photos. We Offer Digital Photo Service Via Internet Complete With Proofing. All You Do Is Send Us Your Photo, Let Us Know Where You Wish Retouch Done, And We Will Send You A Proof Via Email Back. You Verify That You Accept Then Make Payment And Then Photo Is Emailed Back When Payment Clears. Physical Photos Can Be Redone Also, You Need To Send Them To Us, We Retouch And Email You Back The Proof, We You Accept Photo Can Either Be Left Digital Or Photo Can Be Printed (additional Cost). Information Tracking System in Orlando is a company that specializes in Motion Picture And Video Tape Production. Our records show it was established in Florida.